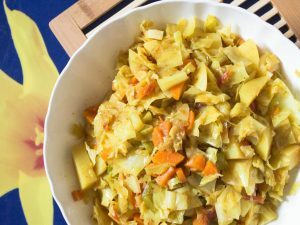 This is a quick and easy way to prepare cabbage as a side dish, and it makes a great change from boiling, steaming, or frying it. Cabbage quarters are simply brushed with oil, seasoned, and lightly sprinkled with lemon juice, then put in the oven and roasted for half an hour. 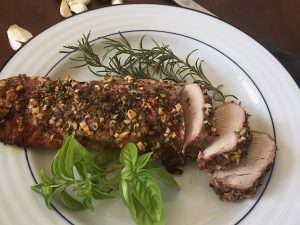 Simple and very, very tasty – especially when served with corned beef or other meat dish. Preheat oven to 450F/210 C fan/gas mark 8. Spray a roasting pan with non-stick spray or olive oil. Cut the head of cabbage into 8 same-size wedges, cutting through the core and stem end. Leave a strip of core on the cabbage wedge if you prefer, to hold the pieces together – this makes it easier to turn them over when cooking. Arrange wedges in a single layer on the roasting pan. 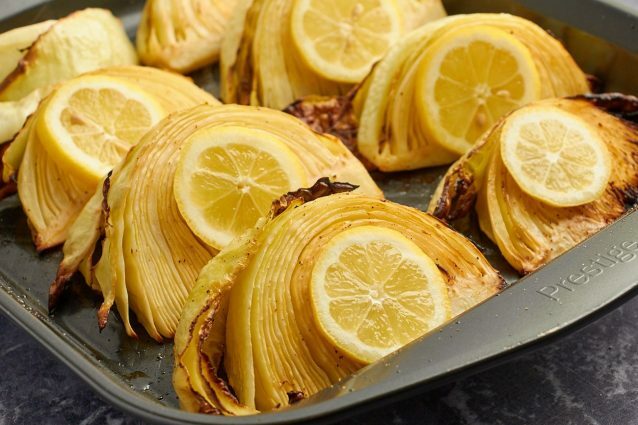 Whisk together the olive oil and lemon juice, then use a pastry brush to brush the top sides of each cabbage wedge with the mixture and season generously with salt and fresh ground black pepper. Then remove pan from oven and turn each wedge carefully. Put back into oven and roast 10-15 minutes more, until the cabbage is nicely browned and cooked through.